This Bergen-based Norwegian band, presumably named after the Elvis Presley song of the same name, is a euphoric addition to the wonderful dreampop genre (though describing themselves as "Tropical Pop-Symphonies). Below is the wonderful video of the song, featuring two kids running around an empty (though wonderfully Scandinavian) house, playing and getting up to all sorts - perfectly fitting the sentimental energy rushing through every second of their eponymous track. This is summer music, full of major scales, soft, heavily-reverbed singing, tropical listen-to-me melodies, and a nostalgic atmosphere that wraps your heart in its warmth. Full of the hope and expectations of being young, the music is quite frankly beautiful - it's folksy, surfy, and totally dreamy; think Animal Collective and you wouldn't be far off. Though, arguably more a 'collective' than their New York counterparts; there are 12 members in the band, headed up by founder, Matias Tellez. 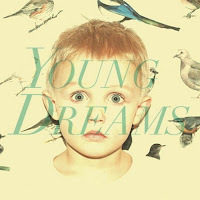 Young Dreams are at the moment signed to the Norwegian electronica label, Tellé Records, and have released two EPs in 2011: Flight 376 and Dream alone, wake together. Both are beautiful. You can read more about them on their Facebook page and listen to all of their songs on SoundCloud.